Sterling silver, real Hematite, and Fresh Water Pearls. Hook dangle earrings measure approximately 2" long (including hook) and 7/8" at widest point. You will absolutely fall in love with this stunning pair of earrings! 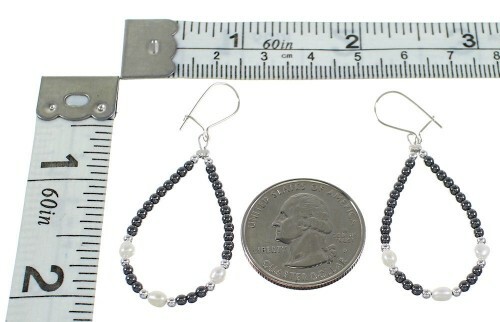 This piece of Native American jewelry is Navajo hand strung out of genuine sterling silver, along with real Hematite and Fresh Water Pearl beads. 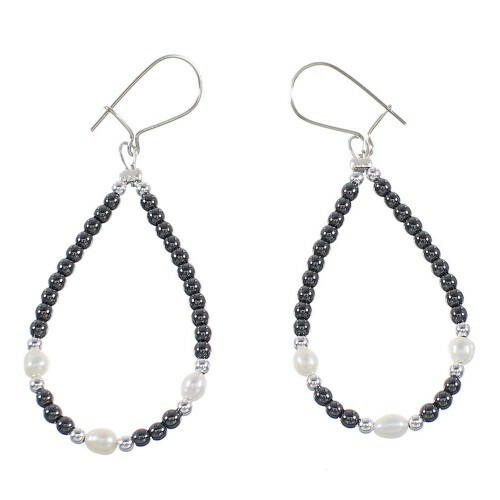 The earrings consists of: 2-mm silver round beads, 2-mm Hematite round beads, and 3-mm Fresh Water Pearls. 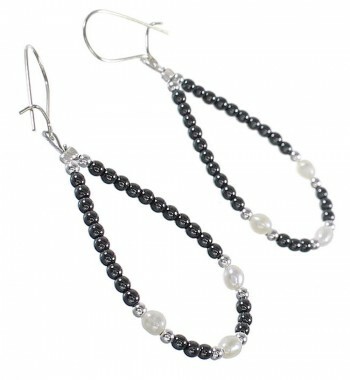 Hematite is believed to be a powerful meditation stone. It is supposed to open you up to be more inventive and help you find your way.